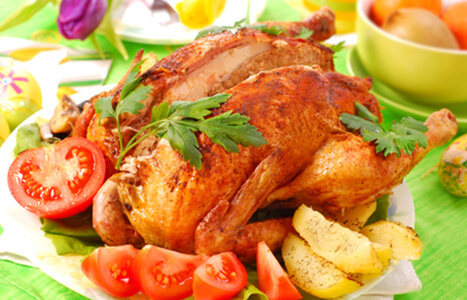 Chicken is one of the most popular foods around. It’s affordable, it can be prepared quickly and easily, and it can be eaten for breakfast, lunch or dinner. In fact, many people eat chicken several times a week, which is okay because skinless chicken can be good for you, especially when compared to some other meats. And yet, as popular as it is, and as much of it as we eat, chicken also has a reputation for being boring, bland, and even tasteless. Luckily, there are countless ways to add flavor to chicken. Two of the most effective chicken flavoring techniques are marinating and rubbing. What is marinating? It’s placing food in a liquid (like chicken broth or Worchester sauce), and letting the food soak long enough to absorb some of the liquid’s flavors. This is an especially good way to add flavor to chicken breasts, which can be a bit tasteless all on their own. Chicken breasts can also be a bit dry, especially if they are cooked just a little too long. 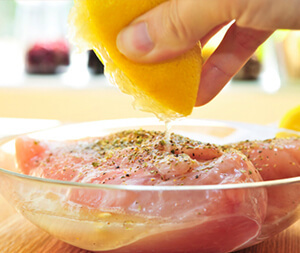 But a marinade can help keep chicken breasts, legs and thighs from drying out during cooking, making the finished product moist and juicy. The longer you can leave chicken pieces in a marinade, the more flavorful they will be. Leaving chicken in the marinade for 24 hours, or overnight, would be ideal. But, if you don’t have much time before dinner needs to be on the table, even marinating the chicken for just 15 or 20 minutes can make the meat more flavorful. There are several easy ways to marinade chicken pieces. One way is using a glass or stainless steel bowl. Pour the marinade into the bowl. Add chicken pieces, arranging them so they are covered by the marinade. You might have to add more marinade to make sure all of the chicken is covered. Put plastic wrap over the bowl. Place the bowl in the refrigerator until you’re ready to cook the chicken. If you want to cut down on clean up, use a plastic food storage bag. Place chicken pieces in a plastic food storage bag. Pour in enough marinade to cover the chicken pieces. Seal the bag tight and place it in the refrigerator. Once you’ve removed the chicken from the marinade, just throw the bag away. Use an acidic liquid (like pineapple juice, soy sauce, vinegar, wine, or lemon juice) as the base for your marinade. This acidic liquid will not only add flavor to the meat, it will also tenderize it. Sometimes, the liquid is enough to marinade the chicken. But you can add other flavoring ingredients, like salt, pepper, herbs, spices, chopped onions and minced garlic. Almost anything you’d use to flavor food can be used in a marinade.